Mazda RX-7 FD turns 25, and we take a retro look at a rotary classic | Car News, Reviews, & Pricing for New & Used Cars. Boom times build interesting cars. In the late 1980s, Japan was flush with capital, and automakers spent like the party was never going to end. Suddenly building the third-generation RX-7 — the world’s most advanced twin-turbo rotary sports car — seemed like the most natural thing a small car company hailing from Hiroshima could do. On this side of the Pacific, however, there was no context for the sudden influx of unusually tricked-out Japanese hardware flooding American dealerships. And none of the Japanese sports cars of the era was more unusual than the FD-generation Mazda RX-7, imported from 1993 to 1995 (and continuing on in Japan until 2002). 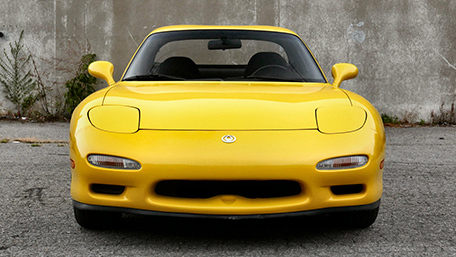 Although the island nation’s economy was headed on a downward spiral by the end of 1990, Mazda was in no position to pull back and walk away from the development dollars that had already been spent on its latest RX-7. As a result, Americans were able to briefly bask in the glow of one of the most unique engineering experiments ever unleashed on unsuspecting buyers. 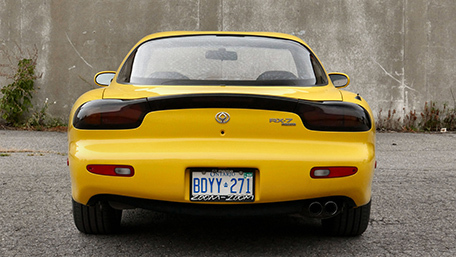 For its time, the Mazda RX-7 was a spaceship. With fluid lines that screamed “exotic,” it joined the NSX in showing that supercars didn’t have to have European blue blood running in their cooling systems to elegantly snag eyeballs. 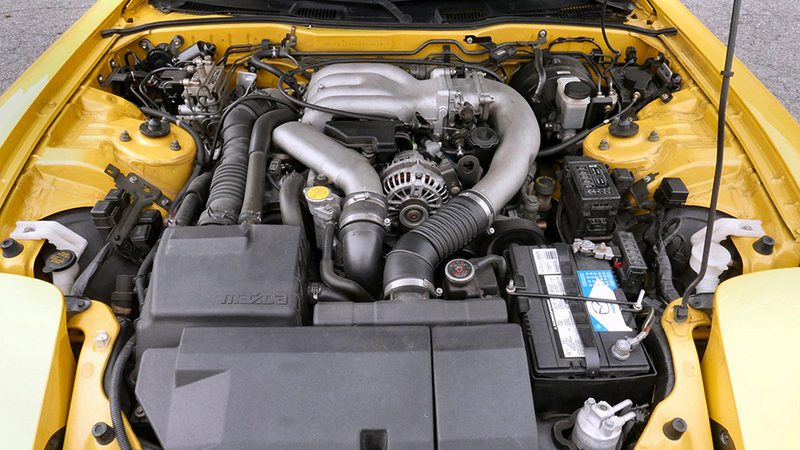 The twin-rotor, 1.3-liter 13B-REW situated behind the RX-7’s front axle revved all the way to 8,000 rpm on its quest to produce 255 horsepower and 217 pound-feet of torque, with a pair of sequential turbos handing boost duties back and forth around the 4,500 rpm mark. A five-speed manual gearbox was standard with the FD (a four-speed automatic was optional), as was a curb weight in the neighborhood of 2,800 pounds — nearly 500 lbs less than the contemporary Toyota Supra. Significant figures for the era, to be sure. 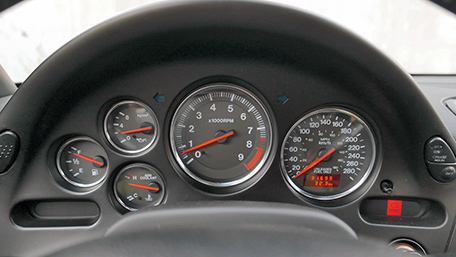 While they might pale in comparison to the average sports car today, slide into the RX-7’s cockpit and drive the car, rather than just crunch the numbers. 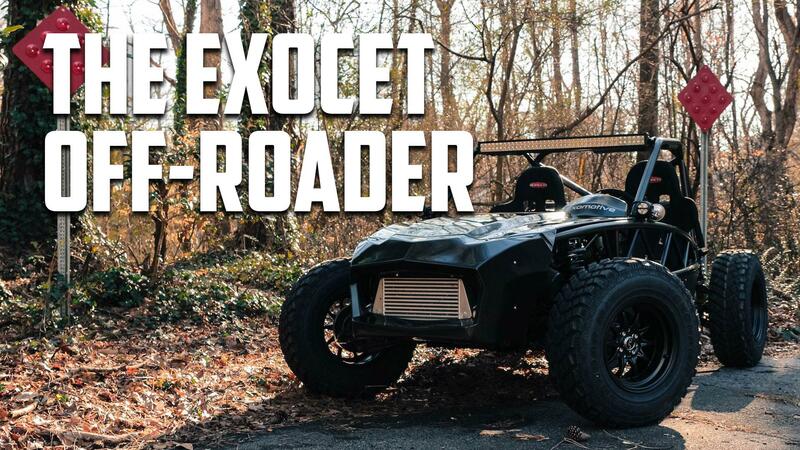 You’ll quickly discover what can be accomplished when the company that engineered the Miata pulls a full John Hammond and “spares no expense” developing a world-beating sports car platform. 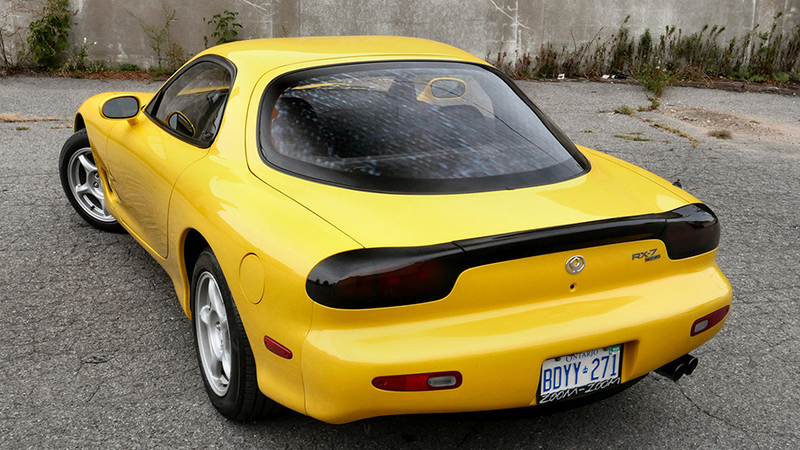 The 1993 Mazda RX-7 I’ve been loaned from Mazda’s classic collection is an R1 car, which means tighter suspension tuning, a few cosmetic upgrades, and a Competition Yellow paint job. Its 13B rotary whirs to life almost immediately upon turning the key — provided, of course, that I don’t trip one of the malfunctioning 1990s-era anti-theft sensors still pulling half-cocked sentry duty 25 years later. There are several key aspects of the FD experience that can’t be gleaned from even otaku-level spec sheet nerdistry (or repeat viewing of Best Motoring). Chief among these is the sheer, silky endlessness of the Wankel’s power band, augmented by a non-stop whoosh as the car rapidly ascends to redline. It’s best experienced on a long stretch of highway, but given that the 13B loves to spin, you can enjoy its wail by keeping the car in second gear around town. Then there’s the balance. The third-generation RX-7 is certainly the last car Mazda ever built to an engineering standard, rather than a price point, and it shows every time you ask its quarter-century-old platform to rapidly shift direction. The coupe remains wonderfully neutral, and willing to rotate on throttle even through longer corners in a completely predictable manner. The tradeoff? A suspension that crashes and bangs its way over broken pavement, booms echoing from the hatch area to remind you that you should really treat yourself to a track day. 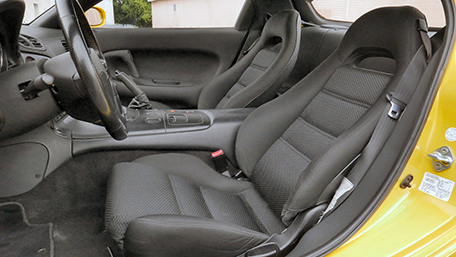 I’d venture that for a ’93 model, the RX-7’s interior has aged far better than it had any right to. 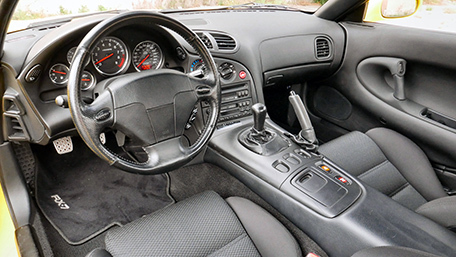 Gauges are clear and readable, the stereo and HVAC controls are logically placed and within reach, and the overall ergonomics of the FD, especially its seating position, are outstanding. 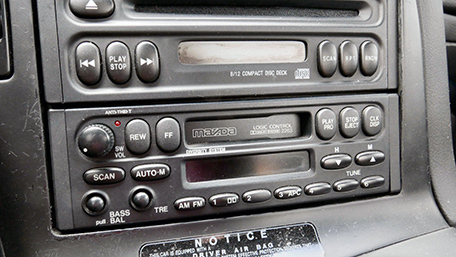 It reveals its age only by the non-adjustable steering wheel cutting me off at the knees and the crackle of dried-out plastics under my elbow on the center console. I’ve so far avoided any mention of the dark cloud that has hung over the FD since the day it left the factory: reliability. Mazda assumed a certain level of mechanical sympathy from anyone willing to take a chance on a high-strung turbo rotary engine, meaning that they would be willing to deal with the flooding (frequent after repeated cold starts), overheating issues (typically solved with an aftermarket radiator or by letting the car idle for a minute or two before switching it off), and, of course, oil consumption (a common trait of all rotary designs). None of these represent a terminal diagnosis to the informed driver, but there were certainly more than a few original RX-7 buyers who resented having to treat the FD like a fussy thoroughbred — followed, of course, by legions of second, third, and fourth title-holders who eagerly hooned and then walked away from blown apex seals and cracked vacuum hoses rather than shovel more money into the pit. Still, excellent examples are out there. For $35,000 you’re likely to find low-miles, cream-puff original car (aside from the required reliability mods), and for $20k a decent driver. With only 14,000 built, the car is uncommon enough to be somewhat of a spectacle when seen on public roads, especially in factory trim — I received numerous compliments about the Mazda while tooling around town. Even though Mazda continues to talk of re-introducing the rotary engine to the masses, the realities of its finicky maintenance requirements and prodigious thirst for fuel conspire to keep it out from under the hood. If the rotary does return, we’ll likely see it as a steady-state electric generator for a hybrid model, a role it’s better suited for due to its small form factor and easy packaging. Seen today, the FD walks a fine line between being a beautiful modern classic that can hold its own against much more recent challengers out on the road, and semi-garage queen that demands some time spent under the hood to ensure continued good mechanical behavior. Then again, if you’re not the kind of “engaged owner” Mazda was looking for when the RX-7 was new, perhaps you’d do better parking something more pedestrian in your driveway 25 years later. Or at least something with pistons.